WebAPP Kit 2.2 無料ダウンロード - Fast create web based applications in minutes by AthTek WebAPP Kit. 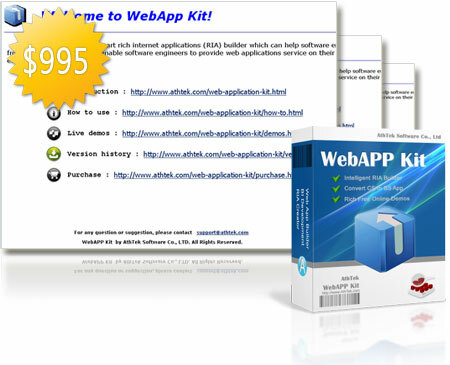 AthTek WebAPP Kit is an advanced RIA builder for web application development. It can help software developers to convert C/S type programs to B/S type web applications effortlessly, with no HTML, JAVA, ASP or PHP skill required. You will be able to create web based application in minutes with AthTek WebAPP Kit. If you are looking for a tool which can enable you to create web applications from your own C/S projects, we highly recommend our WebAPP Kit. AthTek WebAPP Kit supports multi-server and multi-language. The web applications which were created by AthTek WebAPP Kit can absolutely support IIS and Apache as well as other custom servers. With the standard COM port settings, it supports multiple software development languages including Delphi, C builder and VC++. AthTek WebAPP Kit provides you with SaaS which is being greatly used in modern websites. As we all know, traditional C/S type software can only work on PC, and it takes much space as well as CPU of the computer. More than that, to develop a new program, web authoring takes a long term development circle and usually costs large amounts of money for commercial PC software systems. This is the reason why WebAPP Kit exists. It can save your budget and shorten your development circle. 3. Upload the created RIA files and generate a link to the web application. After all those three steps, you would be able to access this web based applications with the generated link. Gantt Control VCL 2.0 enables software developers to schedule tasks and events.